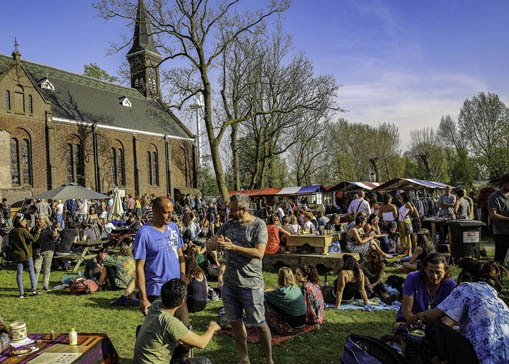 When trees fully blossom and the world turns green, Ruigmarkt once again sets up camp on the magical grounds of Ruigoord with a colourful two-day hippiemarket. Stands from around the world sell remarkable fashion, art, interior, lifestyle, natural & organic, spirituality, records and books. Lots of handmade, vintage and recycled materials. To participate in the market send email with more information between 20 January and 5 April 2019. Earlybirdrate untul 20 March. More info on the Facebook eventpage and in the tab ACTIVITEITEN. Stay up-to-date on future events on www.facebook.com/ruigmarkt.